﻿National Sister Day: Calendar, History, Tweets, Facts, Quotes & Activities. National Sister Day celebrates sisters, the special bond they share with their sisters, and their contributions to the family. It is your opportunity to show appreciation for that special family relationship. It is a day to love and acknowledge the joy that you sister brings to your life and make sure that she knows that you appreciate and cherish her. 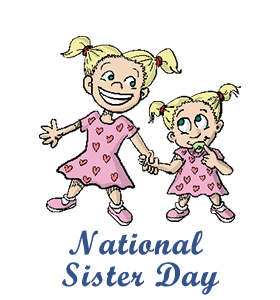 National Sister Day is an unofficial holiday that is celebrated annually on August 7. It was celebrated for the first time on August 7, 2011. Studies form Brigham Young University show that sisters give siblings better mental health. According to the Journal of Politics, boys with sisters are more likely to become republican. Young men who were raised with sisters are more typically more likely to express social conservative views on attitudes about gender roles. Men with sisters are more likely to have involved interactions and be liked significantly more by their female acquaintances than those who did not have a sister. In short, brother benefit from having sisters by having a higher likelihood of getting a date. There is nobody in this world that knows me better than my sister. – Tia Mowry, American actress and model. Sister is probably the most competitive relationship within the family, but once the sisters are grown, it becomes the strongest relationship. – Margaret Mead, American Cultural Anthropologist. Spread awareness on social media by using the hashtags #NationalSisterDay or #SisterDay. Watch a movie about sisterhood. Some suggestions are: The Sisterhood of the Travelling Pants (2005), The Parent Trap (1998), Frozen (2013) and My Sister’s Keeper (2009). Do something with your sister that you know she enjoys. It can be something as simple as a picnic or dinner out on the town. You can even plan a girl’s night out somewhere that is special to your sister and somewhere that you both enjoy spending time together. Read a book about the joys of sisterhood. Some suggestions are: Ballet Shoes , I Capture the Castle , and Pride and Prejudice . Post a picture on social media of you and your sister with a caption of a fond memory between the two of you. Make sure to tag your sister in the photo!